Remember the Make Offer bike from my trip to Concord? That was supposed to be cut up and turned into a sculpture by now. But like the classic Schwinn Worldsport I got a couple of years ago - and tried unsuccessfully to sell it in Brooklyn after Hurricane Sandy - it just proved too nice to take it to the reciprocating saw. So I decided to see if I could make it work for a city - with the extra challenge of not spending any money on the bike aside from tires and a chain. The only reservation I had is that the 700c is a new wheel size. Not only that, but deciding to keep the bike might make others think I'm endorsing the Presta valve. I'm not. 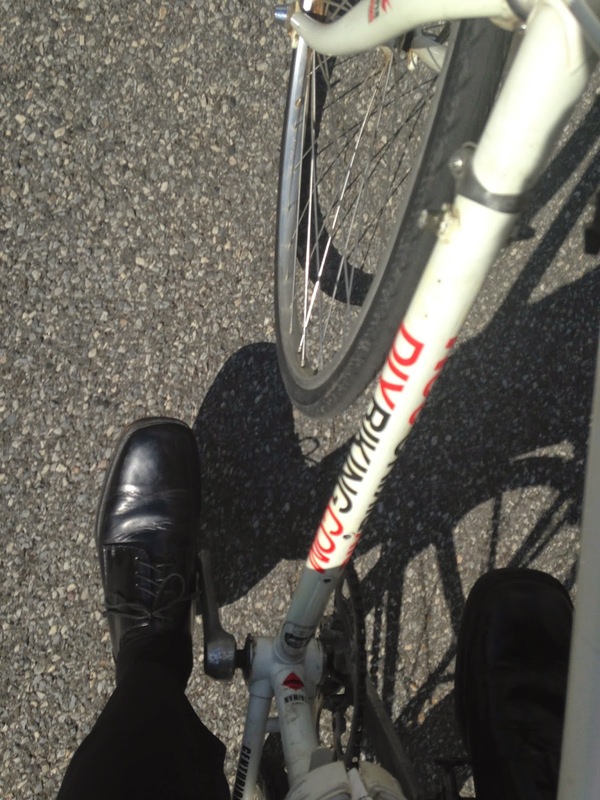 I still maintain that Presta valves are to bikes the way eating a pizza with a knife and fork is to Jon Stewart. That is my position. But back to the build. First thing I needed to do was get rid of the road bike handlebar. That involved peeling off the handlebar tape and being left with a sticky result I could - barely - squeeze through the opening on the handlebars. 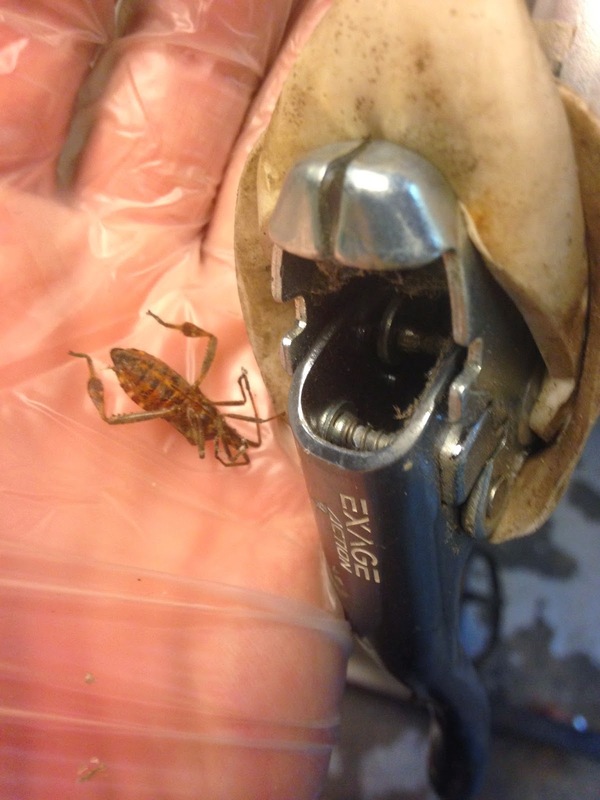 It also meant I got to get rid of a fossilized bug that was stuck in the brake lever. 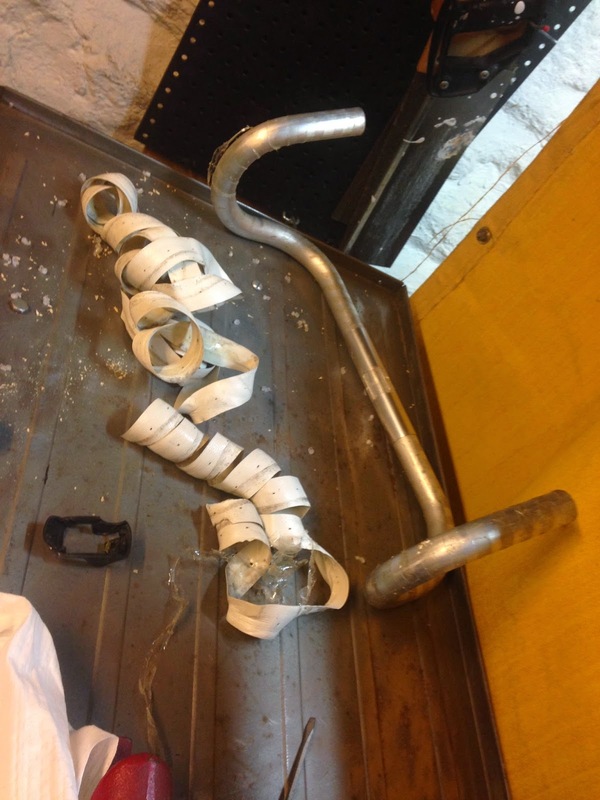 Next I had to push an aluminum handlebar I had lying around through the opening - after I shortened it slightly with a pipe cutter. 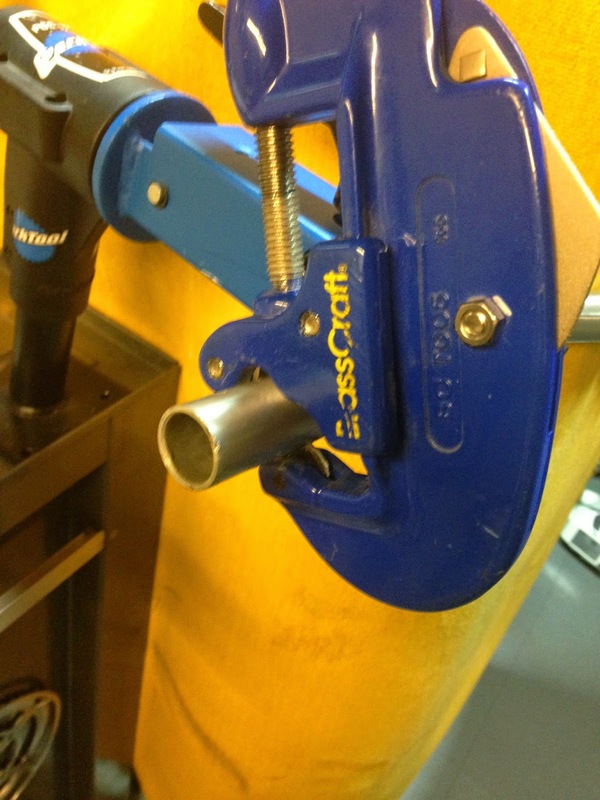 Then came the task I dread: putting on new grips. I made the mistake of trying a set of silicone grips I must have acquired from a joke shop. I did find, when I was building a singlespeed, that hand sanitizer works well as lube - but I wasn't getting off that easy this time. 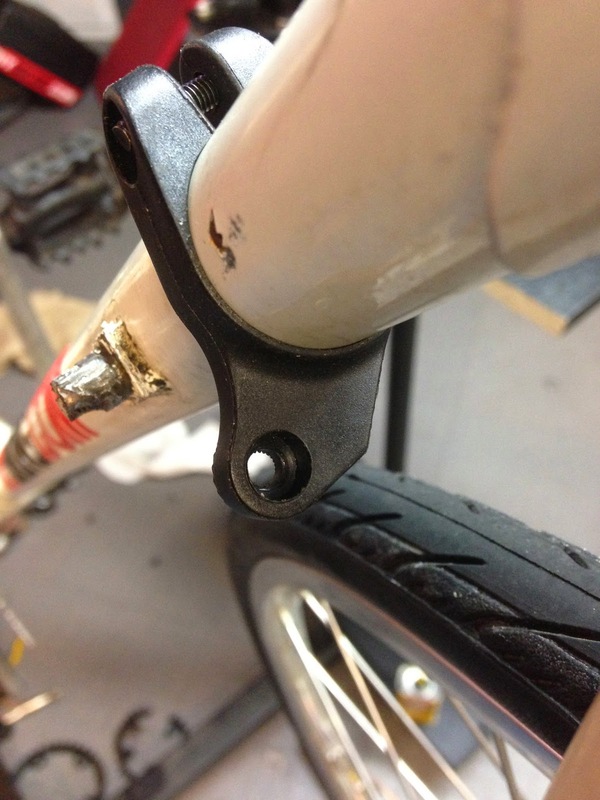 I reasoned that pushing a piece of bike part through the handlebar it would cause the spring to proportionally compress the grip and force it onto the bar. 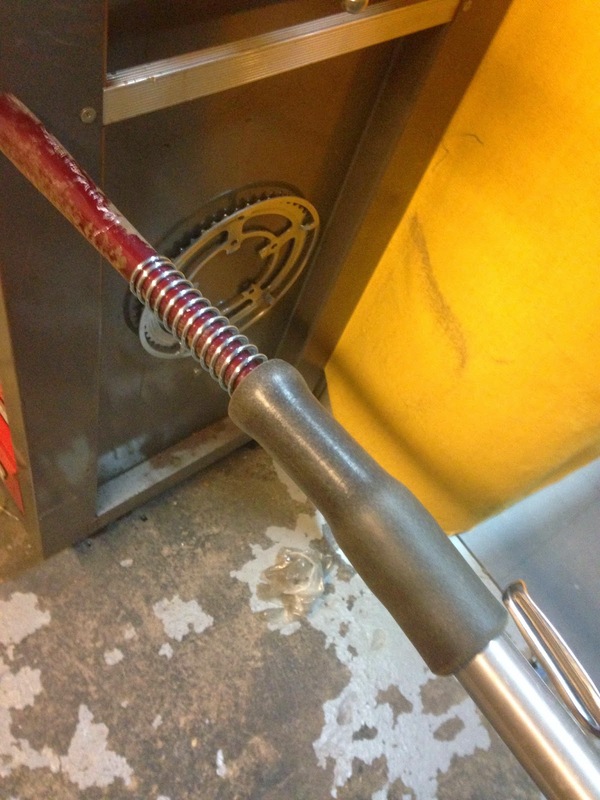 Instead, I pulled the grip off after 30 minutes of struggling. Rummaging around, I found two black rubber handgrips that didn't match. Then I remembered I had a cheap SRAM twist-grip shifter. I never understood why shifters on these old bikes are down by one's knees anyway, so it seemed like a good time to get rid of those. I also decided that now would be a good time to figure out if I could get away without a front derailleur - something I've always had trouble adjusting. 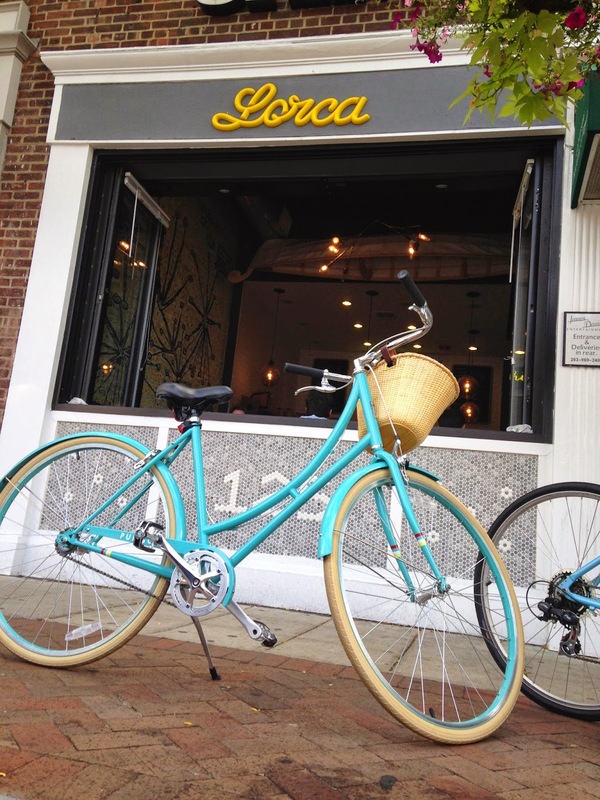 Plus, I thought: what do I need a climbing gear for in downtown Stamford? 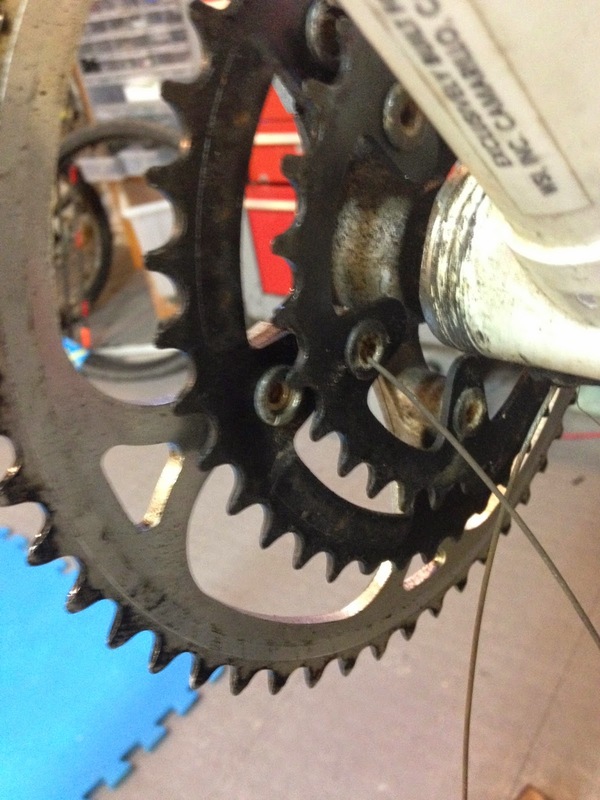 A 52 tooth gear from another Saved from the Scrapheap bike fit perfectly on the spider…and made the others seem quite small. 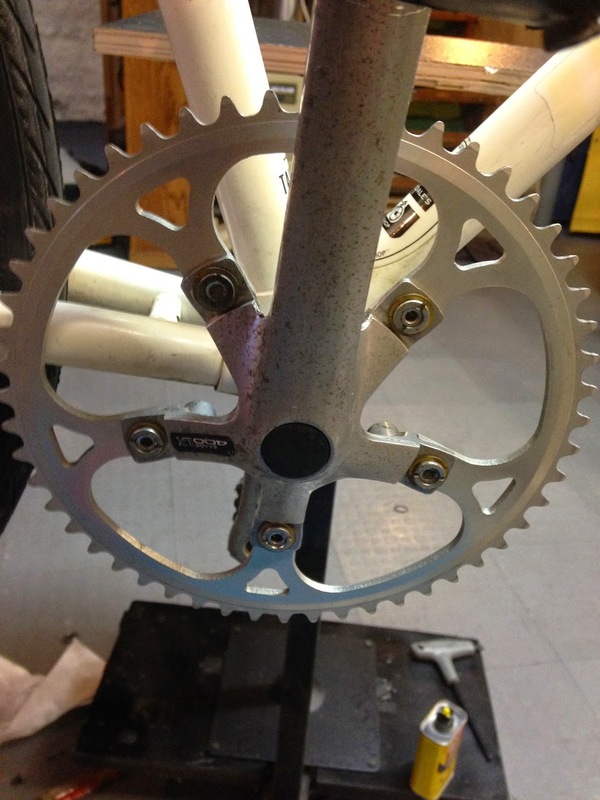 I wasn't in the mood to remove the bottom bracket, so the reciprocating saw was used to get rid of the gears I didn't want. So instead of a 21 speed bike, I had a seven speed. Now I needed to figure out how to get the cables to stay where I wanted them to. 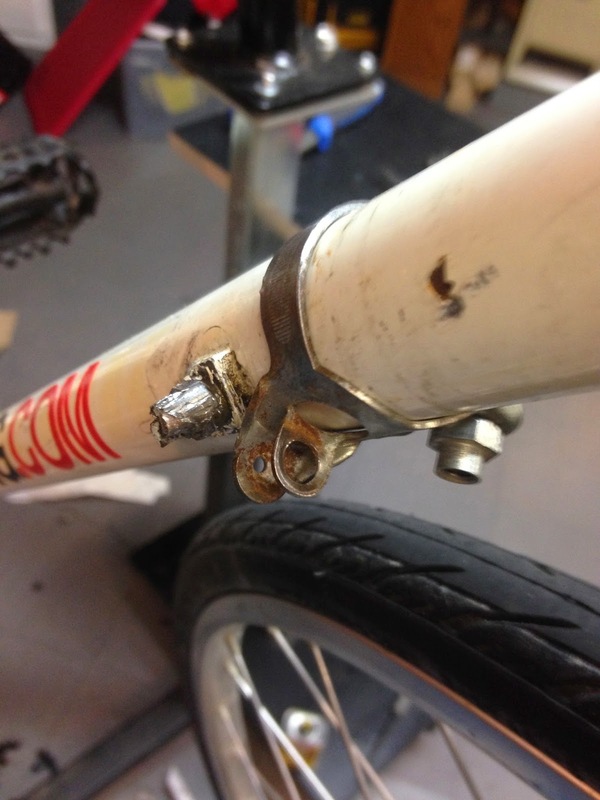 When I modified the recumbent a couple of years ago, I found a metal bit from an old bike that would hug the frame and give the cable a place to rest. At first I thought about using a plastic bracket from a reflector. 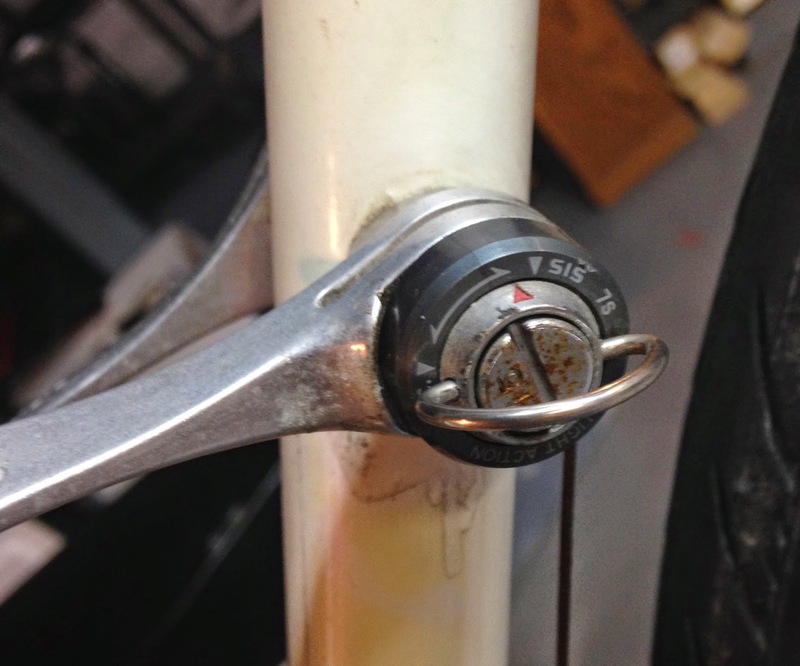 After worrying about the pressure it would be under - and not caring for the look - I ended up finding a metal bracket that may or may not have come from The Mysterious Raleigh Sports. With the shifter in place, the cable where it needed to go, and a rear rack I had lying around and the bag from my former office bike, I had myself a new ride. Riding this reminded me of the compromise that is made between speed and comfort. The ride is fast but stiff. 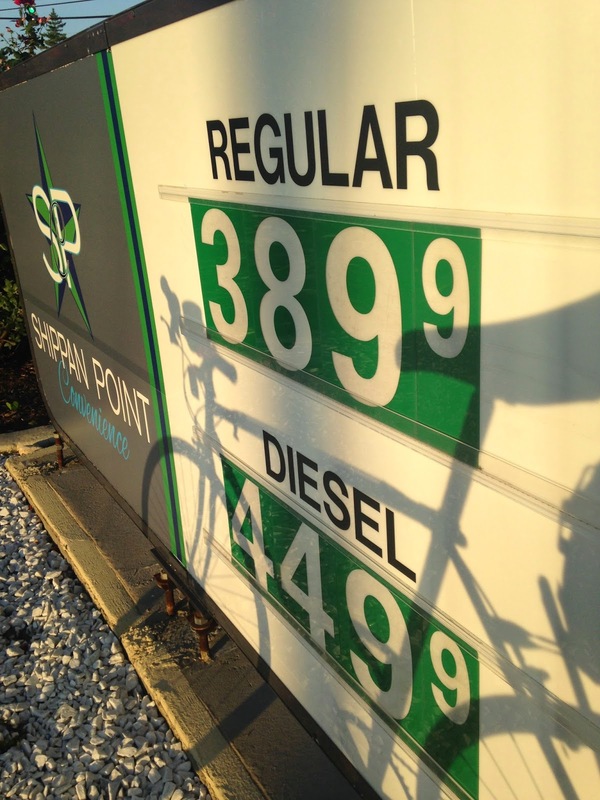 Still, it beats spending $0.17 per mile to drive my car. And with little traffic I can get from my house to Lorca in about ten minutes (As an aside: there are a lot more bikes showing up on Bedford Street and in downtown Stamford so I'm hoping the city takes action with bike parking soon - I'll hopefully have more for you about that in another post). In addition to being useful for Lorca and grocery runs, it can go a little bit further if necessary. 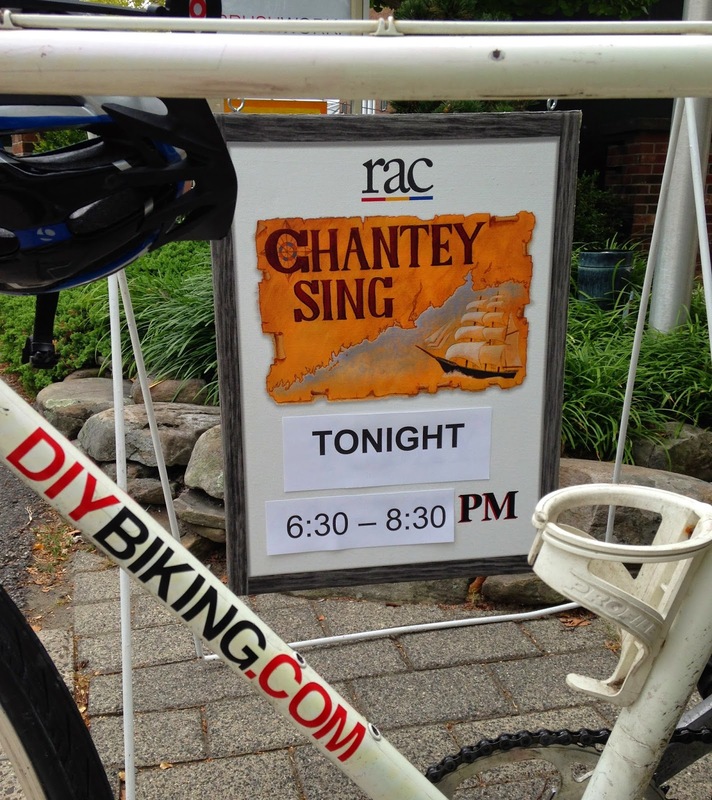 I took it to the Rowayton Arts Center just yesterday - the day they were having their Chantey Sing. The 700c wheel size makes it big and rather unwieldy on Metro North; I tried it on a non-peak train. And my legs felt like lead when I biked home. Still, it's a good fast bike as long as it stays in Stamford. Look for it on the road or chained to a parking meter in front of Lorca - and be safe out there on your own bike. Thanks for reading and thanks for riding. Wow, well done! I may be looking to refurbish some old bikes and this defiantly inspires! Thanks!